Loxicom There are 5 products. Loxicom is known as a non-steroidal anti-inflammatory drug (or NSAID) and is used as a painkiller. 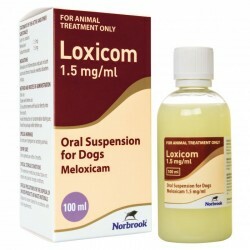 Loxicom oral suspension is available for dogs and cats and contains the active ingredient, Meloxicam. 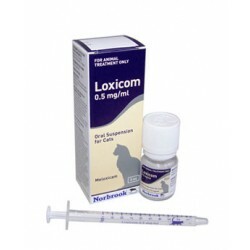 Loxicom injectable is available for dogs, cats, horses, cattle and pigs. Loxicom is known as a POM-V medicine, and as such is only available upon receipt of a veterinary prescription. Online animal pharmacies like us at Vetdispense are only able to dispense this medication once the document has been received. Loxicom is part of a group of medicines known as NSAIDs. NSAIDs work through their inhibition of the cyclooxygenase enzymes. Cyclooxygenase 1 (COX-1) is responsible for many protective mechanisms within the body. For example, the COX-1 pathway is responsible for the maintenance of good kidney function, the protection of the gastrointestinal (stomach and intestinal) lining and blood clotting mechanisms. Loxicom selectively reduces the activity of cyclooxygenase – 2 (COX-2). It is COX-2 that is responsible for production of inflammatory mediators that contribute to pain, swelling, heat and discomfort. It is through the selective inhibition of the COX-2 enzyme that meloxicam drops can provide effective pain relief. What is Loxicom used for? Loxicom is used to treat inflammatory pain. In the vet clinic, we use loxicom to reduce pain following surgery, for example, following neutering or orthopaedic procedures. Loxicom suspension is also commonly used to treat animals that are suffering from musculo-skeletal conditions such as osteoarthritis. Arthritis is becoming increasingly recognised in both dogs and cats. Symptoms in dogs include a reluctance to jump, climb stairs or get into car boots. Dogs can also show reduced willingness to exercise, although many will seem to ‘warm into’ exercise. Often symptoms are most pronounced following prolonged periods of rest, e.g. first thing in the morning. Diagnosing cats with arthritis can often be more challenging since cats are quite adept at hiding the symptoms of pain. In the early stages, owners may only notice a reduced willingness to play or to jump up high. Later in the course of the disease, cats may show muscle wastage associated with the affected joint. Loxicom is also commonly used in cases of soft-tissue injury, eg ligament or tendon sprain or strains. Often, a relatively short course of NSAIDs in combination with exercise modification or physiotherapy can make a big impact in terms of recovery time post-injury. Loxicom for dogs and cats has the potential to greatly improve the quality of life for animals suffering from painful, inflammatory conditions but should only be used according to veterinary advice. 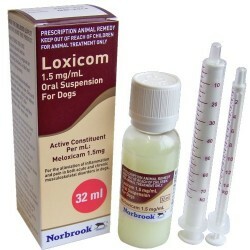 Loxicom suspension is only available on prescription and care must be taken to accurately dose pets. Serious and potentially life threatening side effects may follow if used inappropriately or at high doses. 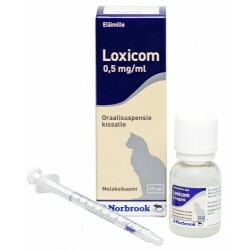 Loxicom may be administered by your vet in the form of a subcutaneous injection. This may then be followed with once daily dosing with the oral suspension. Loxicom chewable tablets for dogs are also now available. Loxicom is available as Loxicom 0.5mg/ml oral suspension for cats, Loxicom 0.5mg/ml and 1.5mg/ml oral suspension for dogs, Loxicom 5mg/ml solution for injection for dogs and cats, loxicom 20mg/ml solution for injection in cattle, pigs and horses, and as loxicom chewable tablets: 1mg and 2.5mg.